Transference: Is it Black and White? 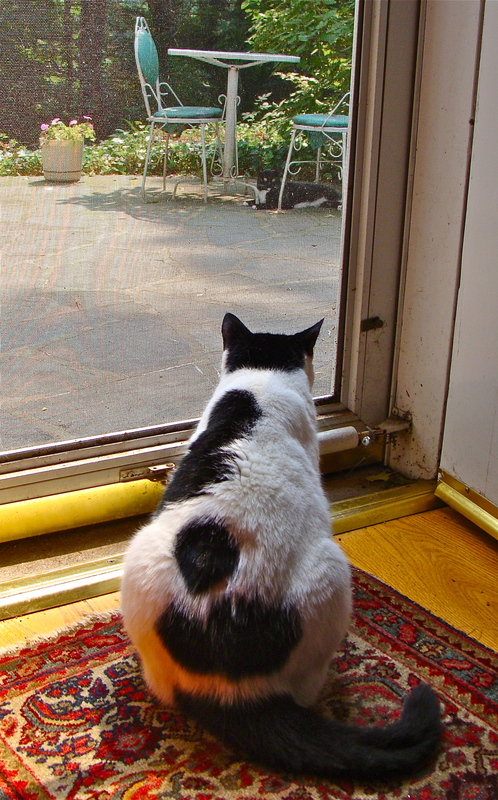 I always understood transference as being a human emotion until I observed my cat’s behavior in response to a neighborhood feline who visits our house regularly. This friendly, cute kitty immediately causes an upheaval within our peaceful two-cat home. Sylvia is the mother cat to Sweetie Bumpkins, and they usually get along quite well, although Sylvia is dominant. So when “Bad Kitty,” the nickname we’ve given the outside cat, stops by, Sylvia begins hissing and meowing and races from window to window to follow Bad Kitty’s movements around the outside of the house. Sometimes Bad Kitty just lays down on the patio, tail swishing back and forth as if to taunt Sylvia. The whole experience comes to a crisis when Sweetie Bumpkins walks into the altercation. Sylvia goes after her with a vengeance with the accompanying yeowls and growls and fur flying. 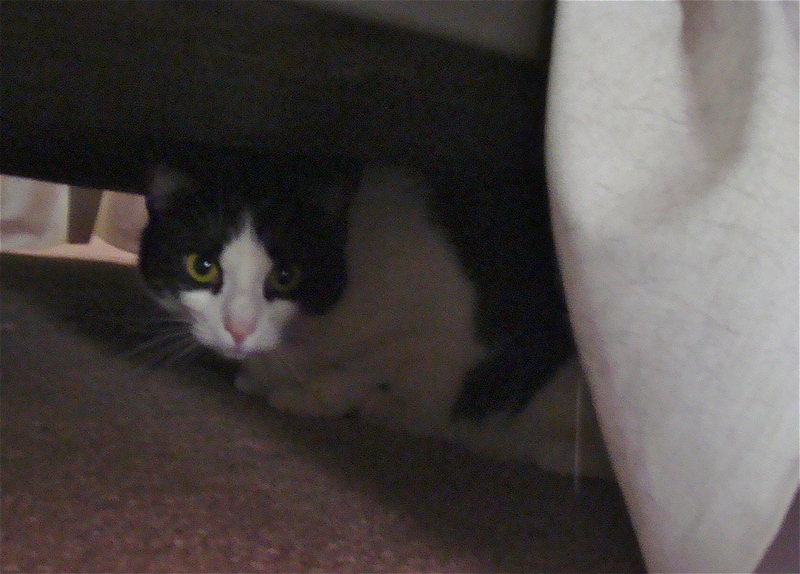 Sweetie Bumpkins runs for her life finding a hiding place safely upstairs under a bed. What occurred to me is that we share some very basic behavior with our cats. Cats and humans are very much separated on their evolutionary lines, and yet in this way, we share the same behavior pattern of taking out our negative emotions on some innocent party, even one who is close to us. Of course, we as humans can become aware of this behavior and change it. But is transference so basic, so ingrained, so part of the wiring in our brain that most of the time, are we unaware of this mind set–say, road rage, corporal punishment, the Tea Party? Perhaps transference occurs at almost every level of our interactions with others. The kitties have demonstrated that this response is an evolutionary device. My personal theory is that transference is a scapegoat mechanism that has evolved to create a release. Neither the kitties nor us can sustain the tension and emotional upheaval within, and nature has provided this release. The question remains whether humans can access these traumas and then change our behavior to relieve the pressures in a socially and ethnically responsible way. The answer is neither black nor white.